It’s often quite surprising what condition we find some tiles in when were asked to come out and survey the floor. Case in point being this Quarry tiled kitchen floor I was asked to look at by a customer in Cheltenham, which as you may know is particularly famous for its racecourse and the top-secret GCHQ. Upon arrival at the property, I found that the floor was not in great condition. 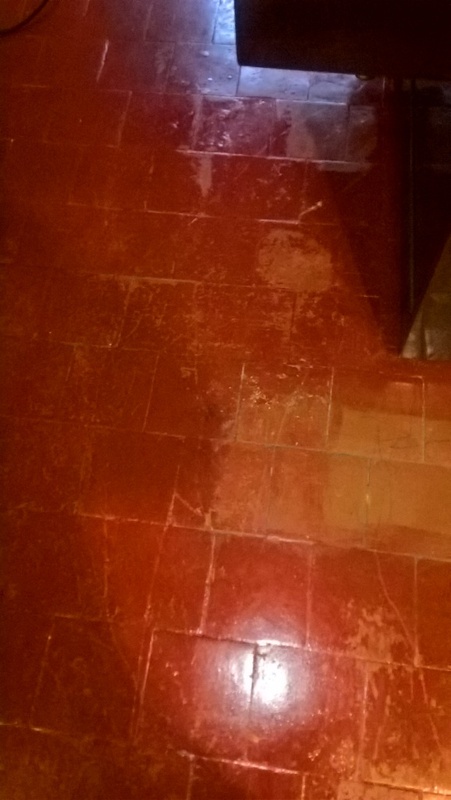 For some reason, it had been painted over with red tile paint and then covered with a wax coating which was easily scratched. To Make the situation worse, there were around 20 tiles in the floor with holes in them that had simply been filled with concrete. Clearly, the tiles had not been maintained properly in the past but fortunately the current owner of the property who was keen to have them restored had called in Tile Doctor and after a demonstration clean I was booked to come back and correct the numerous issues. 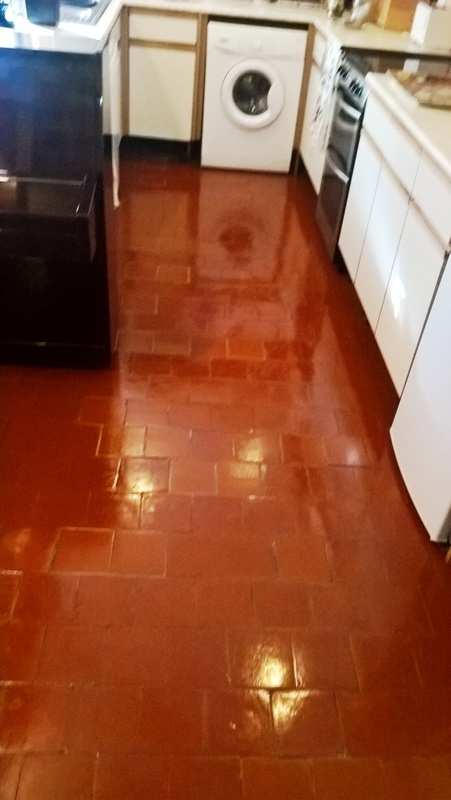 On the first day of the restoration, I started by applying a solution of Tile Doctor Remove and Go across the entire floor and leaving the product to dwell for around 30 minutes. Remove and Go is a powerful stripper designed to loosen paint splashes, adhesive stains and many types of urethane and wax coatings so that they can be easily removed. After leaving the product to dwell, I could use a handheld scrapper to simply remove the wax coating and layer of paint on the floor. 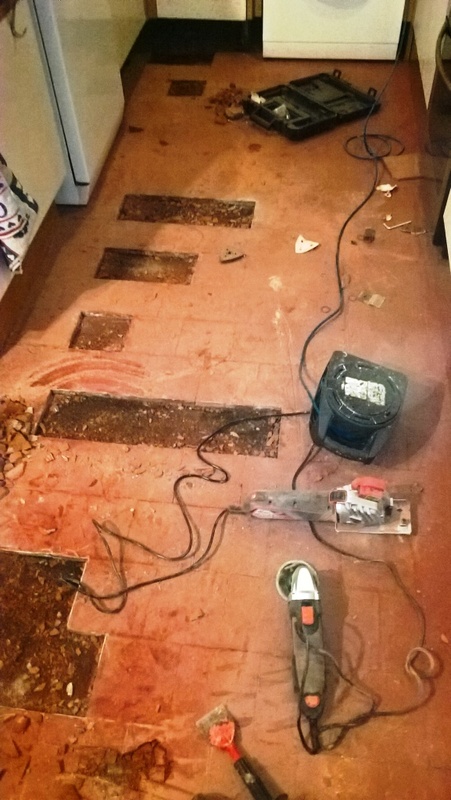 This process took about half a day; during the second half of the day, I spent my time removing the damaged tiles and replacing them with new Quarry tiles that had been sourced to match nicely with the existing floor. On the second day, any stubborn paint splashes remaining were re-treated and I subsequently deep cleaned the floor using a strong dilution of Tile Doctor Pro-Clean. 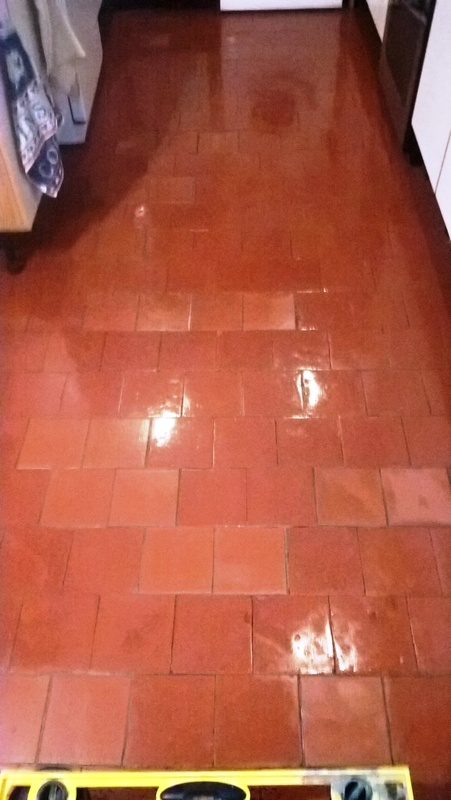 This strong alkaline cleaning product was worked into the tiles using a 17-inch scrubbing pad fitted to a specialised rotary machine. The resultant soil was extracted off the floor using a wet vacuum and given a rinse with water to neutralise the floor. The wet vacuum was used again to remove the water and extract as much moisture from the tiles as possible to improve the drying time. Once the deep clean had been completed, I left the floor dry for two days to allow sufficient time for it to dry thoroughly. Upon returning to the property, I ran a damp test to see if the tiles were dry enough to be sealed. To my surprise, the floor recorded only around 4% moisture even though the property is relatively old and is unlikely to have a damp proof membrane installed. Nonetheless, this meant I could seal the floor. I did this by using a single coat of our impregnating, colour-intensifying sealer known as Tile Doctor Colour Grow, followed by three coats of Tile Doctor Seal and Go, a water based sealer which provides a high-quality satin finish. The deep clean, combined with the application of two different sealers, really helped to give these Quarry tiles a new lease of life. The customer was very happy indeed – in fact, had this been an exam, I’m certain I would’ve received top marks and it was certainly a major improvement on how they were before. Tewkesbury, the town and civil parish in Gloucestershire, is famous for the Tewkesbury Abbey, a Norman abbey church dating back to the 7th century so it has a lot of history and some very old buildings. 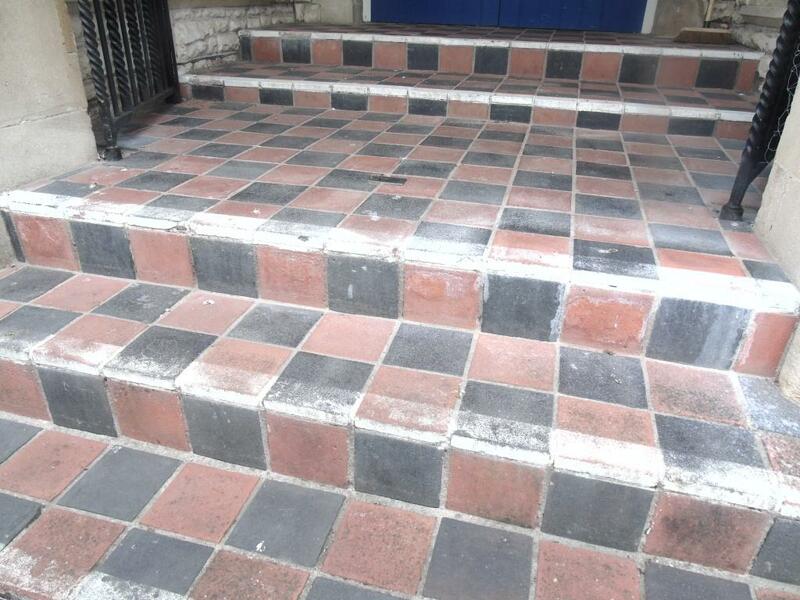 Although not one of the oldest buildings in the town I was recently called to a small church in Tewksbury to restore the Quarry tiled entrance way dating back to the 1850s. The tiles had become very heavily ingrained with pigeon droppings, paint, cement, and general dirt over the years – and they were well past due for some professional attention. My first job was to scrape away all the excess pigeon droppings and paint that could be removed by hand. 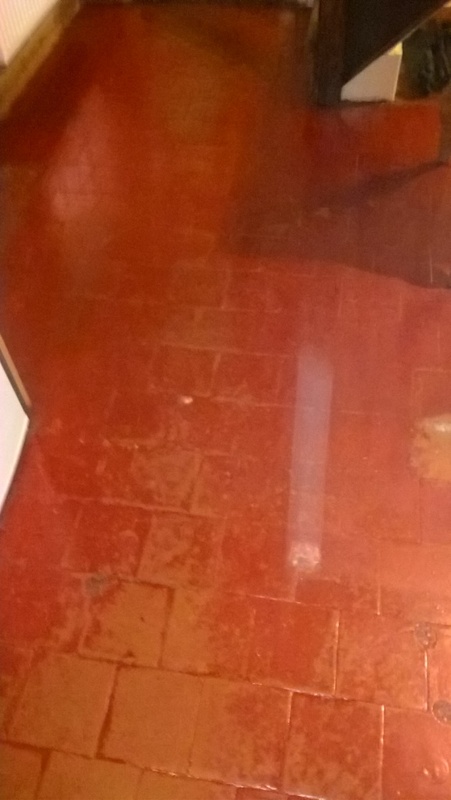 Once the floor was clear, I was able to cover it with a strong solution of two of our cleaning products: Tile Doctor Remove and Go and Tile Doctor NanoTech HBU. While the cleaners are similarly powerful, they serve slightly different purposes. Remove and Go is specially designed to strip away any old sealers, synthetic finishes, adhesives, cements, and paints. It also helps to draw old ingrained stains and remove heavy grease build-up. NanoTech HBU on the other hand is a penetrating cleaner designed to work where other cleaners won’t. It does this by utilizing nano-sized particles to reach underneath tough stains, dissolve them, and lift them out. Both products are suitable for use on polished and unpolished natural stone, including Limestone, Marble, Slate, Travertine and, of course, Quarry. The cleaning solution was left to dwell for 45 minutes and then scrubbed into the tiles using a black pad fitted to a buffing machine. I then repeated this process with the same products to clean the grout lines. When I was happy with the overall cleanliness of the tiles, I spot cleaned some particularly stubborn stains using a steam cleaner in combination with a handheld scraper and some more NanoTech HBU. After finishing the cleaning process, I left the tiles to dry for two days. The tiles needed a good amount of time to dry completely because the old tiles don’t have the reasonably modern benefit of a damp-proof membrane. 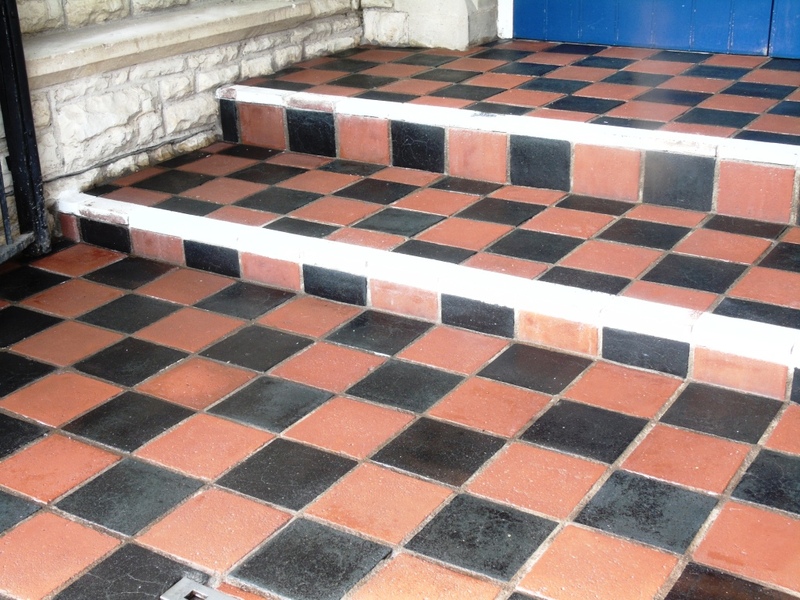 Upon my return to the church I checked for any damp issues, and when satisfied that there weren’t any to deal with, I proceeded to seal the tiles using four coats of Tile Doctor Colour Grow. This is an impregnating sealer that enhances the natural colours in the Quarry tiles and provides the natural look, matte finish that the proprietor of the church had requested. As you can see from the photo below, the result of the restoration was transformational. 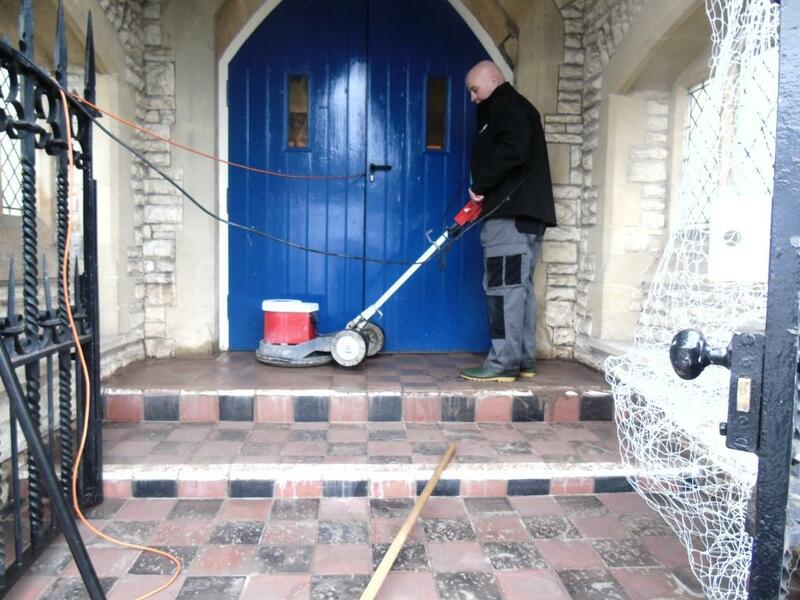 Needless to say, the parishioners will be very happy with the rejuvenated entrance way and, thanks to a highly durable sealant, the steps will be protected for the long term.